First time Deaf students play the ice hockey match in Malaysia! I am happy for some Deaf teenagers who interested in playing ice-hockey and joined in the friendly match with Dexion Wildcat at Sunway Pyramid! They need to practice more to become good player. 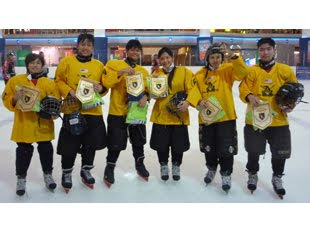 Deaf Hawks will participate in the Deaf Competition Ice Hockey with other Deaf strong group from the Asean countries? Parents and Deaf people come to support them at their friendly match! It is good to increase Deaf Awareness and face big challenge to success when the Deaf teenagers be patient to improve their skill and learn something new!